Where’s Your Sit offers professional, in-home pet dog training services for puppies and adult dogs, and indoor/outdoor dog training classes. We serve Calgary, Alberta and surrounding areas. One of my clients forwarded me an email that I thought I should share with as many people as possible. Please note that I have not confirmed any of the details below but just in case it's better to get the word out. Please note this can be just as dangerous for children as pets. Use caution when walking in the area or avoid it altogether. 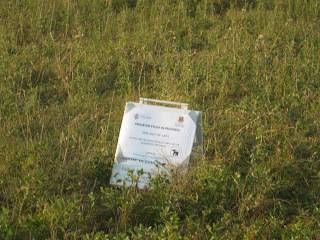 I was walking my dogs up at Nose hill tonight enjoying the evening when I saw a sign about 20 feet to the left off of the pathway. (Shaganappi Entrance - heading east on the pathway). I begin reading off the sandwich board style sign - printing isn't very big so I approach the sign. The University of Calgary is conducting a "predator study - all dogs must be on leash and remain on the designated pathways". Two of my dogs had run into the trees to find the birds while I was reading. Before I could finish reading one of them is yelping! I run into the trees and realize they are caught in a leg trap!!! (the only good thing about this story is the trap doesn't have teeth - it just has bars that snap closed on the leg)!! A smaller framed dog may end up with a broken leg - or worse - be left as bait for hungry coyotes because the owner cannot find them.There are several (rusty) old traps set up in the same vicinity. A board with spikes or nails is also in there along with two cameras/videos. 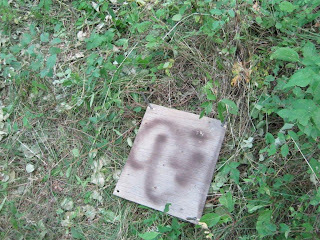 The boards are likely bait boards with food under them to entice the animal into the right spot for the leg trap to release. The sign never once indicated any potential harm. The message only states you will face a fine should you not comply with the on-leash rule. Again by the time you read the sign, it may be too late - as I experienced. This is extremely irresponsible with far too many implications considering the amount of people and dogs that frequent the hill. I haven't even touched on the harm and trauma that the various wildlife will face. I am outraged and shocked that The City and the University have moved forward with this study without warning or providing any details to the public. I have provided photographs of the leg trap, the board with spikes and two signs. 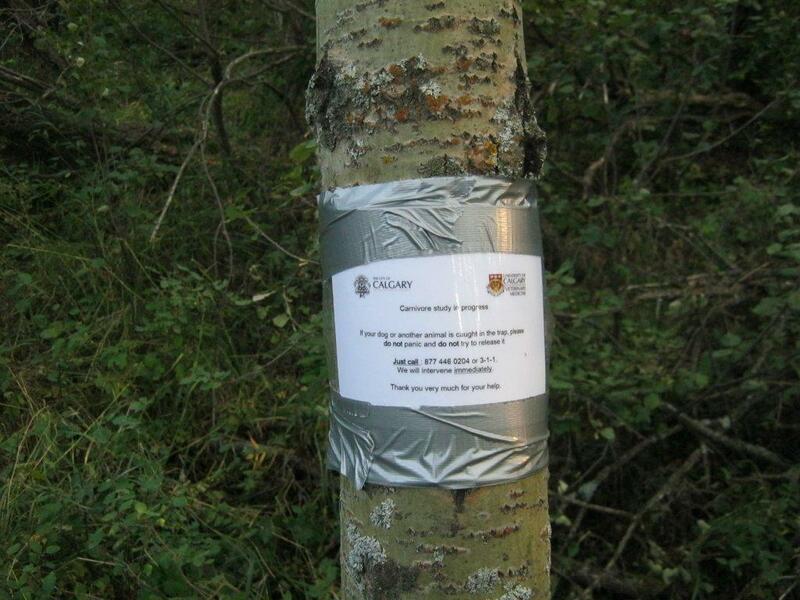 Please forward this message to those you feel may be affected (people who take their dogs out to Nose hill who's dogs may run into the trees)! did they call 311 to ask what is up?! I called 3-1-1 this morning about it and they had no idea, but Animal Services wasn't open at that time and they told me to call back. I googled the 877 number that is in one of the signs and it is a company called Animal Damage Control. I just can't believe they don't have signs at the entrance to the park! Clearly the lack of signage is not acceptable. The leash law is the law, so be it. But dog owners should be aware from all access points to the park that the U of C is doing this. That's the only real problem here. If it's a predator study, that means that they are trying to determine park safety for people (and dogs) which ironically could prevent animal attacks on both. Weird that they would overlook proper notification. Nosehill does have large sections of off leash areas for dogs. I'm not sure if this zone falls into that or not. UPDATE: CBC reporters are looking into this and it seems like the City is aware of the study. They did not put out a media advisory though. I'll send out more news when I get it. Please keep your dogs on leash and stay away from this area. This is terrible, how can these tactics, especially a board with spikes in it, be considered acceptable. In a public park no less....?!? The city is not involved with this and it's highly unlikely that the university is either. First of all, those signs are not city of calgary signs and city would never do or even approve of anything like this because of the liability that would be involved. It's most likely some idiot who uses the park and has issues with dogs off leash. You could already tell just by looking at the pictures, especially the board with nails, that it's not the city or even the university. This has been reported to the city parks department and they will be investigating. This city has been confirmed as being aware of this study. I thought it might be a person just doing this on their own too but a reporter got confirmation from the City of Calgary that they are aware of it. I have a friend looking into his contacts with the U of C Veterinary Medicine faculty to see what they have to say. No matter who is doing this it is WRONG WRONG WRONG! AARCS has rescued two dogs from leg traps this year and both beautiful anmimals have lost a leg. This is a public park when anyone can step in a trap. What if a child gets injured? Heck what if a person out for a stroll wandered off a path and into a trap. What study is so important that they need to have leg traps? My name is Tara Weber and I work for the CBC. We have confirmed there is a 'predator' catch and release program happening. They are trying to study the movements of coyotes. We're out at the park now. Good job on getting this media attention Jade !!!! Can you ask them how leg traps that can crush bone are appropriate for a "catch and release" program? My name is Alessandro Massolo and I am an Assistant Professor in Wildlife Health Ecology with the Faculty of Veterinary Medicine at the University of Calgary. I am the supervisor of the catch and release study that is happening in the Nosehill, Bowmont and Fish Creek parks. We are conducting this study in partnership with the City of Calgary and it involves catching coyotes, fitting them with GPS collars to track their movements, and then releasing them. It will help us understand how coyotes use and move around the urban environment and interact with humans, domestic animals and other urban wildlife. It will also contribute data to other ongoing studies that we conduct in partnership with the City, including a recently announced examination of gastrointestinal parasites in Calgary dogs. 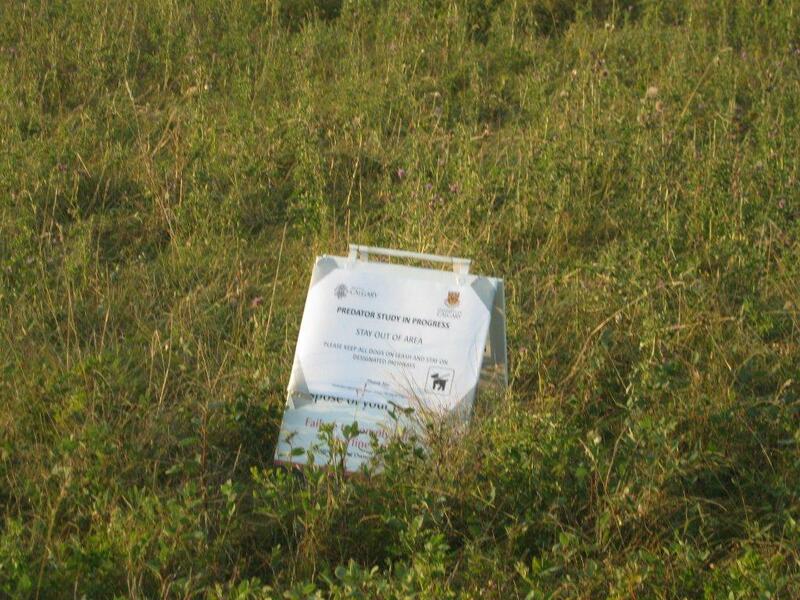 The findings may ultimately help improve the management of our city’s natural areas and ensure a better environment for people, their pets and wildlife, enabling them all to coexist in the urban landscape. The catch and release equipment referred to in this blog has been placed off of the main trails, in heavily wooded areas and are only open between dusk (from approximately 8 p.m. onwards) and dawn. The equipment has only been placed in designated on-leash areas to minimize the potential for accidental capture of animals, as the assumption is that they would be on a leash and accompanied by a handler. We have also placed warning signs approximately 50 metres away from these areas. 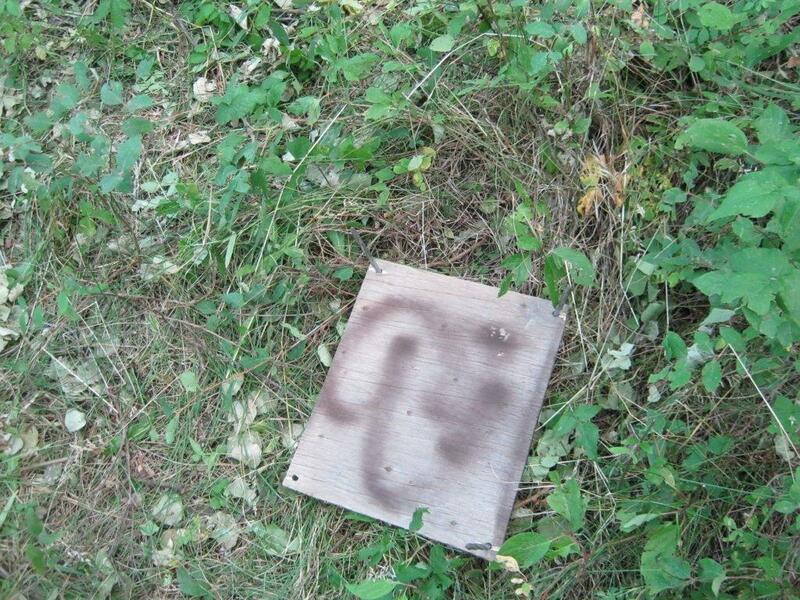 The “wooden board with spikes” also referred to is not a bait or a trap – this is simply a cover that is placed on the apparatus during daylight hours to prevent it from being activated. The catch and release equipment is humane and is not intended to injure animals or people. In the event of a dog becoming caught, there are nearby signs immediately adjacent to them to indicate a phone number to call for immediate assistance. Any dog caught will immediately be conveyed to an emergency 24-hour veterinary clinic. I can assure you that this study was subject to rigorous academic ethic approvals prior to being undertaken and is entirely humane. We did our best to mitigate potential risks and it is not our intent to have any animal hurt. We are taking this feedback, such as the readability of the signage, seriously into consideration and we will look into making appropriate modifications. We appreciate your understanding and concern. I can't imagine it being a pleasant experience for any animal being caught in one of these leg traps over night. Have there not been incidences of animals chewing through their own skin and bone to escape? Do you know how far it is to the nearest public phone from Nose Hill Park? Not everyone has a cell phone and those who do don't always carry it with them. If my dog were to get caught in one of these I'm sure as hell not calling any number and wait for you to decide how to handle the situation. It will be way faster for any owner to take their pet immediately for emergency care. Frankly your advice is counter intuitive. Surely there have to be more humane ways to capture and release. Disgusted by The City of Calgary and The U of C! How can you even pretend this is humane? 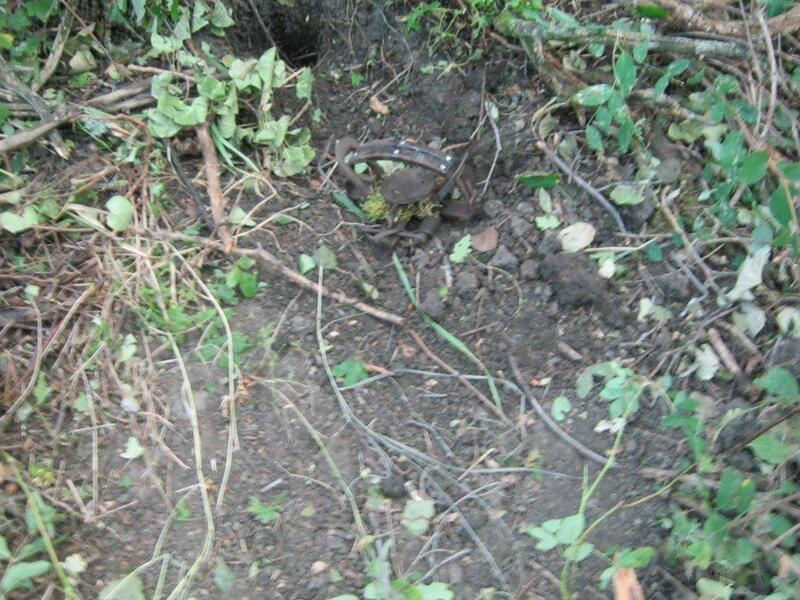 Remove these barbaric traps immediately and find some other way to "monitor" coyotes. No animal deserves this! If these leg traps are so humane, why do you say, "Any dog caught will immediately be conveyed to an emergency 24-hour veterinary clinic."? They're only humane for coyotes and not our delicate pooches? BS! And if they are protected with a board with spikes (???) to keep them from activating during the day how did the dog owned by the person who originally reported this get caught in it? This seems like an extremely poorly thought-out study. What is wrong with a humane cage trap? This is so ridiculous it looks more like someone is trying to set the city and the UofC up to look really bad. What a shockingly careless way to conduct a study. So why does it list to call 3-1-1 on the sign when numerous people have called there today and no one seems to know anything about it? And just because it is a designated on leash area, there will still be some dogs off leash and also potentially kids in the area. Get better signs, tape of the area or something! Why are you people so up in arms, take a minute get educated! The study will hopefully give a greater insight into the predators that live in the area and may be more harmful to your dogs than a harmless leg trap. Get a grip. I think you need some education! If I come across one of these things I'm taking it and the spiked board and throwing them in a dumpster. Leg traps hurt. They can break (if not crush) bone, and animals have been known to bite off legs when they're caught. Not to mention any animal caught is essentially bait for another predator to come along. Look up the damage a leg trap can do and tell me how "harmless" they are. I am shocked that a Professor, no less a Professor of Veterinary Medicine, actually thinks this is a justifiable method of capturing animals. This is a poor excuse for a study and it is really unfortunate that the U of C and City of Calgary thought this was ok. It is absolutely NOT ok and everyone needs to speak up about this. I am a dog owner but this could affect anyone that visits these parks. What is this world coming too? Spread the word, people! In today's day in age I agree there are multiple ways to research and learn about species, watching behaviour is more than likely one of the best none threatening way. It is important to collar coyotes, wolves, bears, moose, whales and so on. This research does protect us humans from encounters or damaging their environment more. It educates us to appreciate nature and animals. Littering has more effect on these animals than ever. Where is the news cast about that? I dare everyone to look at our city streets and roads and side roads, this effects our animal population more than you know and in the long run your own lives. Lets be logical and fair - you would freak out more if someone was walking around with a tranquillizer gun at Nose Hill. The technology is not there yet to create a trap that will not alarm people or hurt the animal. These people are more than likely bigger animal lovers than you and I, hence why they have dedicated their lives to a more than likely, low wage to studying their movements - to protect you and that particular specie. Larger signs at entrance would or taping those sections off. Just keep your dogs on a leash.. I am curious to know why these concerned dog owners are not as outraged from the piles of dog poop (bagged and unbagged) left on Nose Hill? There is probably more of a health risk to you and your pooch from these droppings which contain E.coli bacterium and possibly other parasites like roundworm tapeworms, hookworms etc. Can someone please explain why there are all these piles of bagged dog poop (I assume) along the trails? Why aren't they being carried out of the park and disposed of? Or, just obey city bylaw and control your dog. The trap was in an city on leash area why were you disobeying city bylaw? These traps are specially designed not to cause injury. I am a dog owner but am sick and tired of other irresponsible dog owners who do not follow the rules and let their dogs run free where there is city signage stating it is an on leash area. This lady sure would be screaming if a coyote ate her dog. And for the people who feel so sorry for the coyotes, you should spend some time in rural Alberta where trappers still use the teeth leg traps, or idiot snowmobilers run them over for fun. They also have coyote hunts where who ever shots the biggest one gets a prize. You don't even want to know what they do with the remains. I feel the same way about uncontrolled children in all of the parks. Put them on leashes!